Topping pine trees involves removing large branches in mature trees, with little regard to where the pruning cut is made. This is a practice that is often carried out by city services on trees that grow near electrical lines. However, topping can also be undertaken by home owners or landscapers with no experience in tree care. The reasons for topping a pine tree include reducing the tree’s height and removing branches to reduce storm damage. 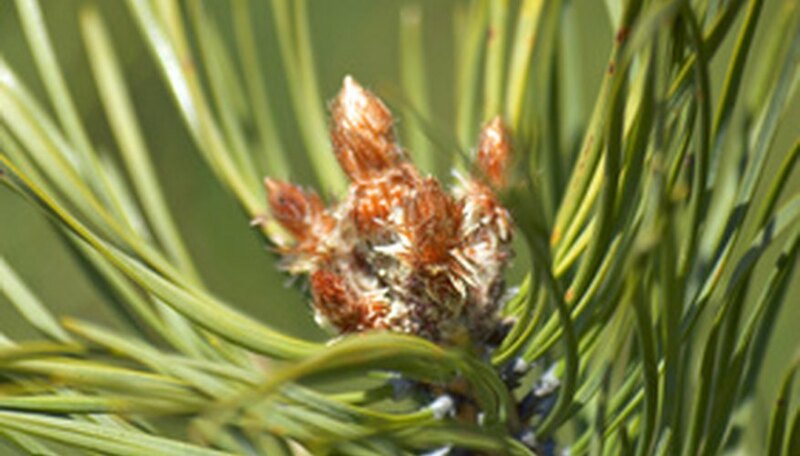 Topping a pine will stimulate new growth in the tree’s limbs, but this growth is not entirely beneficial. Examine your pine tree to determine where you want to remove the branches. Place a tall, professional ladder by your tree; climb it. Tie survey tape around each branch you will cut using survey tape. The tape will help guide your later cuts. Pull your saw up to you on the ladder. If you don't have a partner in the process, tie a rope around the saw before ascending the ladder; pull on the rope at this point to retrieve the saw. For safety concerns, always cut at chest height and never over your head. Use your saw to remove each limb off at the point you marked with your survey tape. Cut your branch three times. Make the first cut 1/3 of the way through the branch on the underside. This cut will prevent the branch from peeling away part of the tree trunk bark and trunk layer when it falls. Make the second cut on the top side of the branch 3 inches down the limb from your first cut. The second cut should go through the branch to remove the limb. Cut the branch a third time to remove the stub extending from the trunk of the tree. The third cut should start at the top of the branch, and it should extend through the limb. However, it should be on the trunk side of your first cut. Tie a rope to large branches when you cut them off. Throw the rope over a higher branch to use as a pulley. Lower each cut branch to the ground slowly for safety purposes. Always wear protective gear--including a hard hat--when cutting limbs off of a tree. Topping a pine may not mean removing the top from the pine. Instead, it may involve removing side limbs. In extreme situations, all side limbs from one side of a pine may be removed. If the top of a pine tree is removed, the tree typically dies. Iowa State University: Topping - Tree Care or Tree Abuse? Purdue University Forestry and Natural Resources: What's Wrong with Topping Trees?